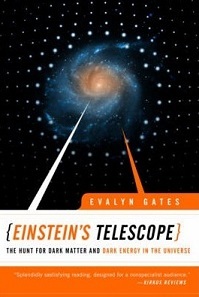 The Blurb: Evalyn Gates, a talented astrophysicist, transports readers to the edge of contemporary science to explore the revolutionary tool-“Einstein’s telescope”-that is unlocking the secrets of the Universe. Einstein’s telescope, or gravitational lensing, is so-called for the way gravity causes space to distort and allow massive objects to act like “lenses,” amplifying and distorting the images of objects behind them. By allowing for the detection of mass where no light is found, scientists can map out the distribution of dark matter and come a step closer to teasing out the effects of dark energy on the Universe-which may forever upend long-held notions about where the Universe came from and where it is going.